Harper's Young People was an illustrated weekly publication for children containing delightful serialized stories, short stories, fiction and nonfiction, poetry, craft projects and more. 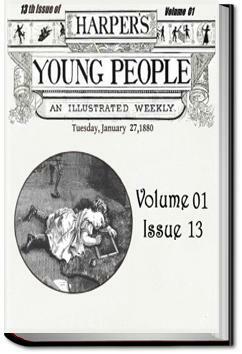 This 13th issue of the serial, published on January 27, 1880, features an eclectic collection of stories sure to delight present-day children as it did the children of centuries past. This serial was published by Harper & Brothers, known today for their other publications Harper's Bazaar and Harper's Magazine. . . .A young man on a jet-black horse came riding through the woods. His face was bright and handsome, and he looked out upon the world with as merry a pair of eyes as you would care to see. "Oh, if he would only take me home!" thought the flower. "I should like to be rescued by such a handsome youth as he." And in spite of her yellow primrose face, the little flower actually blushed. "What a bright little flower!" said the young man, as[Pg 140] he rode along. "If it were not so much trouble getting off my horse, I would carry it home to Marjorie. But it's only a commonplace little primrose after all," he added, and so rode on. That night the little flower cried itself to sleep among the shadows, and before morning it had withered on its stem. "I will never make the attempt again," said the Princess Bébè, when she found herself once more in the kingdom of the mineral-workers.